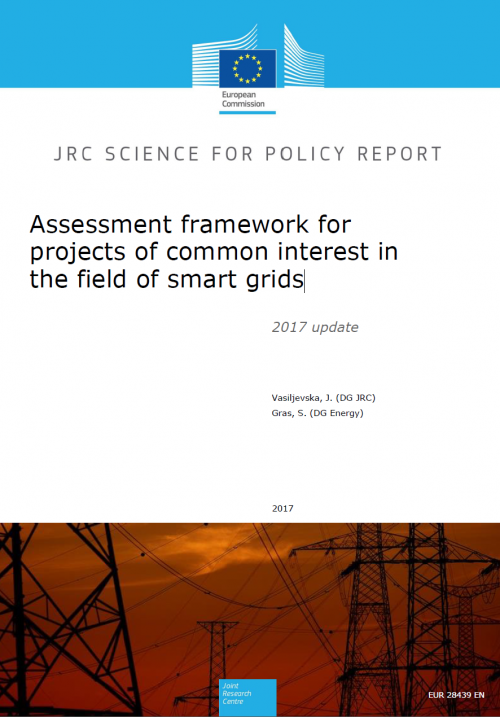 The document presents an update of the assessment framework, a methodology to assess smart grid projects of common interest, in line with Regulation (EU) No 347/2013 on guidelines for trans-European energy infrastructure. In this context, every 2 years the European Commission establishes an EU-wide list of projects of common interest (PCIs), consisting of key energy infrastructure projects in the EU. These are essential for completing the European internal energy market and reaching the EU’s energy policy objectives of affordable, secure and sustainable energy. The assessment framework for smart grid PCI candidates is based on Annex V to the Regulation and it consists of: i) a checklist to verify project compliance with the general criteria, set out by the Regulation in Article 4(a) and (c); ii) a cost–benefit analysis to argue the economic viability of the project; and iii) key performance indicators (KPIs) based analysis for evaluation of the non-monetary impacts. The assessment methodology is intended to guide project promoters in preparing their project proposals and assist the Smart Grid Regional Group in proposing smart grid projects of common interest.